Dustin is a Lubbock native, playing lead guitar for 20 years. With miles and miles of live performance credit under his belt, he is continuing to branch to new horizons. At a very young age, Dustin began singing on a professional level in various theaters and music shows in the area. At only 10 years old, he headlined the "Bill Anderson Hour" at the Grand Ole Opry in 1998. Soon after, The Texas Cruisers were formed and blew away the Lubbock/Amarillo classic rock scene. After high school, Dustin chose to further his education at South Plains College in Levelland, TX. Leaving with a degree in Commercial Music, he joined The Taylor Hickey Band from Mineral Wells, TX with their first single "Sawdust On The Dancefloor" a hit in the DFW area. In the summer of 2010, Dustin began a trek to become the next undiscovered King Of The Blues, a contest through Guitar Center. He became a Top 5 national contender, where he performed in Hollywood House Of Blues Sunset with guitar legend Derek Trucks. 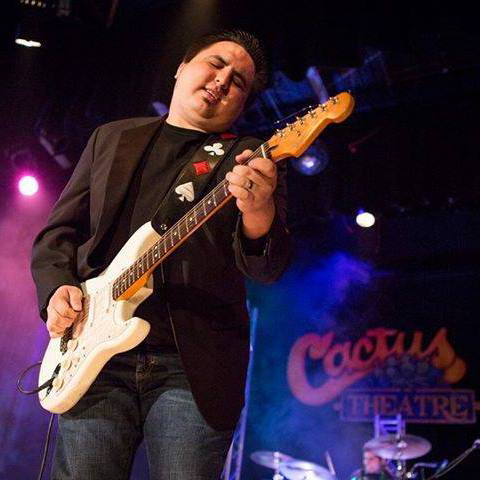 Returning to Texas, he was Music Director at the Historic Cactus Theater on Buddy Holly Avenue in Lubbock for 5 years. Dustin also is an active studio musician at Caldwell Productions, Rt 1 Acuff Studio, and Amusement Park Studio. Dustin currently is a senior Music Director, Producer and Singer/Musician for Caldwell Entertainment’s concert productions division.